So I finally got a chance to check out the Occupy movement firsthand. Two years ago, I heard media outlets first ignore, then report various contradictory and often denigrating stories about Tea Party gatherings. I made it a point to withhold judgment until I could go see one in person. So when I saw similar patterns in the reporting of OWS, I tried to do the same. Here, in somewhat random order, are my thoughts now that I’ve seen it up close. First of all, I need to be completely up front about the fact that I didn’t have time to really get a good picture of what was going on. 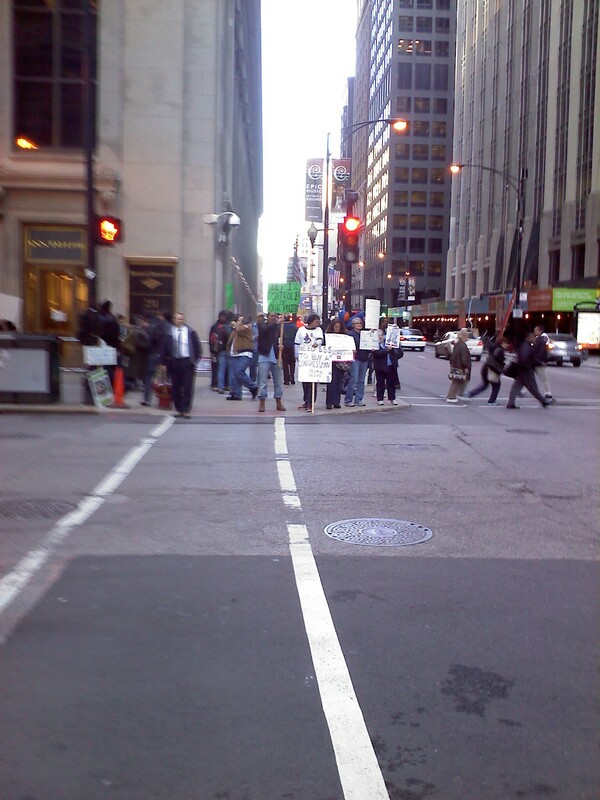 I walked through the Occupy Chicago headquarters on Jackson and LaSalle at around 4pm on Monday, and only had about 20 minutes before I had to be on my way for greedy capitalist purposes. There were around 50 protesters (if you include the drum circle and those asleep on the sidewalk). They consisted of around 20 people lining the street with signs, another 20 or so sitting in small groups on the sidewalk or taking part in the drum circle, and maybe 10 people wandering around distributing flyers. And yeah, two people asleep in a pile of coats and assorted protesty folderol (signs, guitars, blankets, bikes, etc). 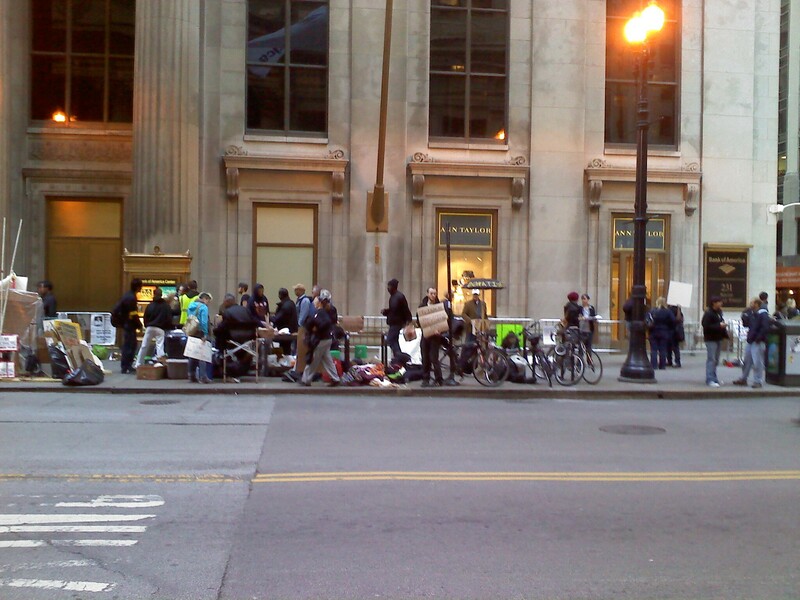 I’m not sure how representative this picture is of Occupy Chicago as a whole. I realize this was just a random point in the day, there was no General Assembly scheduled for another several hours, and there was no march that day. According to their website (occupychi.org), their marches consist of “thousands,” and as a matter of public record, there have been multiple arrests of between 100-200 for refusing to leave Grant Park after the park is closed. A couple of differences struck me between this and the Tea Party rally I attended last year. One was the signs. I took notes at the TP rally and wrote down every sign I saw. It was easy because they were simple. Things like “Taxed Enough Already” and “Obama Is Bankrupting Our Grandkids” are easy to read from across the park and write down quickly. This protest had a few like that–“Need $$$ To Buy a Congressman, Please Help” was one of my favorites. A few of the signs held by the people pictured to the right were short and sweet, things like “Honk If You Are The 99%”. But most of the signs were half a book, and frankly, I didn’t have time. I wrote down the first one (“Distrusting unregulated capitalism is not treason. Exporting trillions of American dollars in bad loans, ‘Free Trade,’ and outsourcing sound much more traitorous to me!”) before realizing I would not be able to write down everything and keep the use of my hand. Signs like that were not only being carried, but were posted all over the police barricades that had been put up–as it turned out, I didn’t even have time to walk through and take pictures of each sign. There was also a clear difference in organization. The Tea Party, love it or hate it, quickly became very good at setting up events and getting out a message. TP rally at X time and Y place. A thousand people show up, speeches are given, everybody cheers, everybody goes home. Message distributed. This was disappointing. The instructions on their website consist of the following: “There is someone in front of the Federal Reserve Bank building at Jackson and LaSalle 24/7. Come out and join us.” I did, and found a few people playing drums, holding long-winded signs, and basically blocking foot traffic in a public place. Message not distributed. No, I didn’t attend a General Assembly. If it’s anything like what was recorded in Atlanta, I want nothing to do with it. At first I wondered why, since they actually had a megaphone there, they were still using the “human microphone” technique. The poster of that video, however, put it best: “People abandoned their individuality and liberty to be absorbed into a hypnotizing collective.” The short repetitive chanting eliminates individual thought. It’s a tool for fostering and enforcing groupthink. You say not what you’re thinking–you say what they say, literally. Count me out. I didn’t see any evidence of cleanliness or public health issues here, besides simply being in the way and sleeping in public. There were rules posted concerning keeping the place looking nice, and I did witness a couple of protesters running up to stop another sign-toting protester that had a dog with her, when the dog looked like it was getting ready to express its feelings for Wall Street right there on the sidewalk. As for the recent arrests, here’s what I told a good friend I was debating recently. It’s not a first amendment issue. Constitutional rights have boundaries. Just like free speech doesn’t allow you to shout “fire” in a crowded theater, freedom of assembly doesn’t allow you to take over public land and live there. It’s perfectly proper for the police to kick people out of a park when the park closes. If you’re trying to set up a semi-permanent camp in a public park, it’s no longer the public’s park–you’re trying to make it YOUR park. I can’t go pitch a tent on the tennis courts down the street either. Of course, I understand that most of the arrests are sought out on purpose. Much the better to get media attention, and who doesn’t love to be a martyr when you get to go home in the morning? Chicks dig guys that are willing to sacrifice for a cause they’re passionate about. Moving on to bigger issues. On one level, I understand the anger and frustration of the protesters. No really, I do. Things are bad out there. 16% real unemployment with no recovery in sight. Record profits but little hiring. I even get on board with a couple of specifics–I do want to see the ratings agencies investigated for their role in the housing collapse. Nobody was forced to take out loans they couldn’t afford, but something’s wonky when S & P looks at that bad loan on an overvalued house and calls it a AAA-safe investment. That said, I think the protests are deeply misguided. Much of the protests center around income inequality. I see charts tossed around like the one at right. This is from a hot-off-the-presses CBO report looking at peoples’ changes in income, inflation-adjusted, from 1979 to 2007. The top 1% is making a lot more than they used to, and this is one of the things getting the OWS crowd all riled up. I heard Representative Sandy Levin (D-MI) on the radio today claim, based on these numbers, that the rich have gained and the middle class have just been “treading water” for 30 years. But this all ignores the fact that every bar on that graph is positive. The fact that the most productive and successful people are making a buttload of money has not taken anything away from anyone else. Just the opposite. The lowest quintile, the poorest of the poor in America–their inflation-adjusted income grew by 18% according to this report. The middle class, far from “treading water,” saw their income grow by 40%. The rising tide really lifted all boats. We can all win together. OWS, your own figures betray you. It’s not a zero-sum system. Those 1%ers don’t make anybody poor. Their success breeds our success. Furthermore, in a free market, you don’t have to support anyone you don’t want to. If you don’t like Bank of America, fine, don’t do business with them. Tell me who you think I should support instead. But as a general rule, success is good. Let’s not protest success. This is where the Occupy movement is misguided. The 1% aren’t the problem. You’re mad that there’s too much money in politics? I have bad news for you. There will always be rich people trying to influence leaders. So vote for freedom from their influence. Vote for smaller government. The less power the government has, the less it matters who owns what politician. So many conservatives today are rallying for smaller, less powerful government. If you don’t like the influence of the 1%, you should be thrilled to hear the ideas coming from the right. We might not wear cool Guy Fawkes masks , but we’ve got real solutions. No violence in OWS? Really? Besides the fact that nearly a third polled said they would support violence to advance their agenda (http://on.wsj.com/oGGhy2), a common symbol of the movement is a mask worn in a graphic novel by a violent anarchist that blew up buildings, tortured and/or murdered hundreds of people? The mask based on a real-life man that attempted to blow up the British House of Lords with the King and the entire nobility and aristocracy inside? That’s your best nonviolent symbol?